These spicy potato fritters are one of my go to recipes when I’m cooking for a crowd. I made them recently for my birthday party. They are an easy to eat finger food and taste great served warm or at room temperature. There are two ways I like to make them: Mumbai style with garlic or the Gujarati way, without garlic. 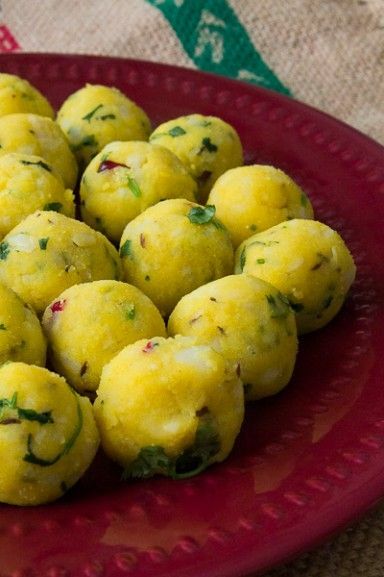 My mom makes them the Gujarati way, except she adds onions which most people do not. 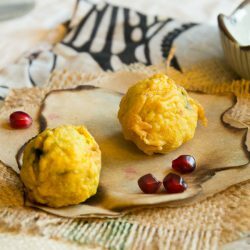 I like to add pomegranate arils to both recipes because they add a nice sweet and tangy contrast to the spicy potato, but these are optional. 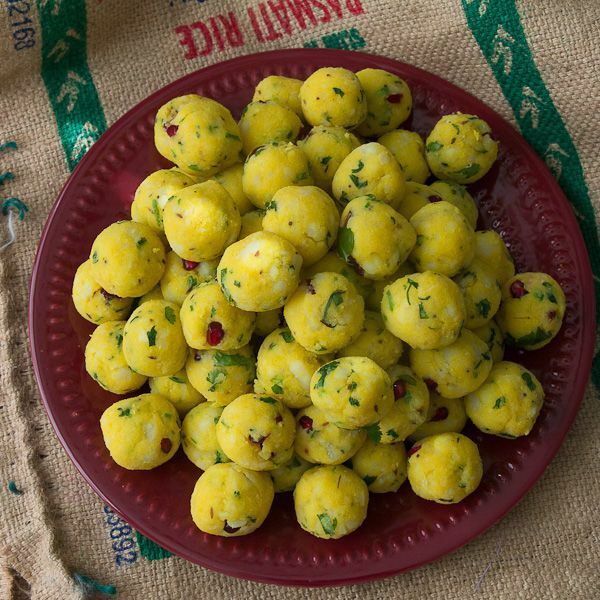 The potato is such an integral part of modern Indian cuisine that it’s hard for me to believe that it is a relatively new addition to the cuisine. Even though India is one of the largest producers in the world today, there was no potato in the Indian diet two hundred years ago. Personally, I am really happy that the potato was adapted into Indian cuisine. I don’t think there is any cuisine that has more variety of applications for potatoes than Indian food. Potatoes are used to make curries, sandwich fillings, added to snacks, used in place of eggs to bind patties, and so much more. Indian food just wouldn’t be the same without the potato. Potatoes originally came from the Andes region in South America where it was first cultivated about seven thousand years ago and probably grew wild for thousands of years before. It was brought to India by the Portuguese in the 1800s. The Gujarati word for potato is batata, the same as in Portuguese. When they were first introduced to the country, they were seen with suspicion by the Indian population. But in the last two hundred years they’ve become one of the most loved and widely used vegetables in the cuisine. 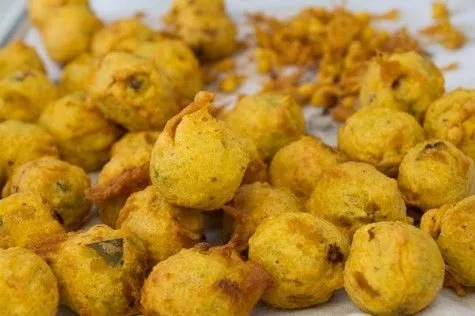 These batata vada are garlicky and super delicious. I’ll share my mom’s recipe another time. In a large bowl, coarsely mash the potatoes. You want to have some small chunks mixed in with the mash. In a medium frying pan, heat 2 tbsp oil. When the oil begins to shimmer, add the cumin seeds, mustard seeds, and asafoetida. Stir for about 10 seconds. Then add ginger paste, garlic paste, green chili and half the chopped cilantro. Stir and cook for about 20 seconds. Add to the mashed potatoes. 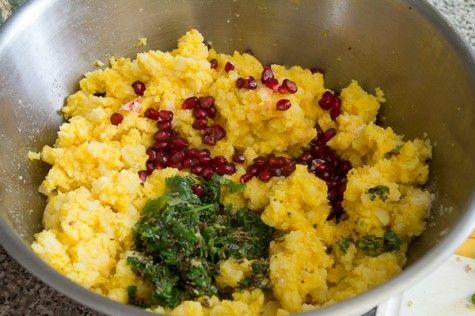 Add the turmeric, rest of cilantro, salt, and pomegranate seeds to the mashed potatoes. Mix well. 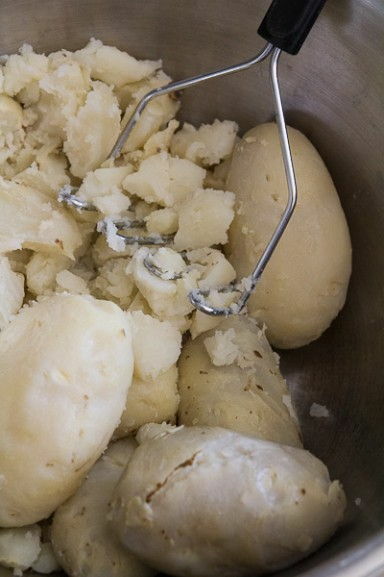 Form small balls with the mashed potato mixture but rolling about 1 tbsp of the mixture been your palms. Add the water and whisk. Do you best to remove as many lumps as you can. Heat the oil over medium high heat in a medium wok or an electric fryer (a cast iron pan or a heavy bottomed stainless steel pot will work too). Test the oil by dropping a tiny bit of batter into the oil. If the batter bubbles and immediately rises to the top, the oil is ready. 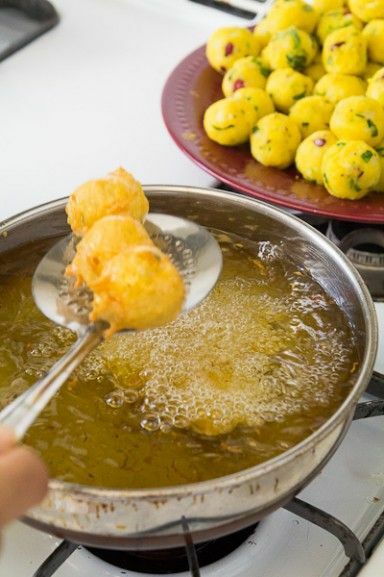 Dip the potato balls in the batter, using a fork, pull out the batter dipped potato ball and gently drop into the hot oil. You can fry about 4 to 10 balls at time, depending on how wide your pan is. Using a slotted spoon, stir the potato balls in the oil so that they cook evenly. When the batter turns golden brown, scoop out from the oil and drain onto paper towels. This recipe makes about 40 to 45 fritters. 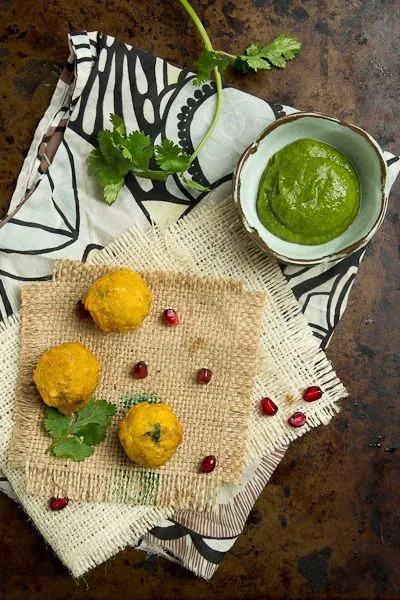 Serve with green chutney, tamarind chutney, or ketchup. Make sure to save the boondi (the little bits of fried batter that collect on the side). They are delicious on their own and you can also make raita with them. These batata vada are super delicious even if you make them without pomegranate seeds. 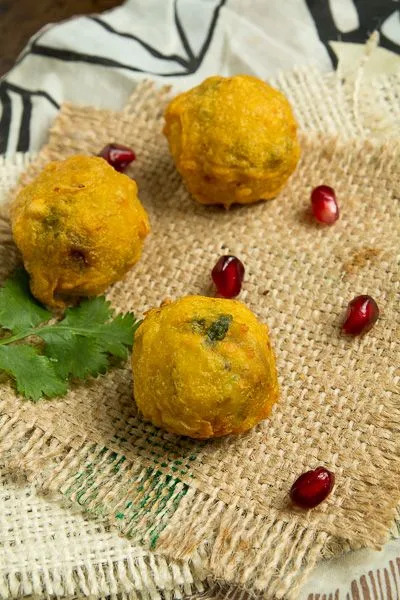 Comments on "Batata Vada (Spicy Potato Fritters)"
Love the use of pomegranate seeds in batata Vada! 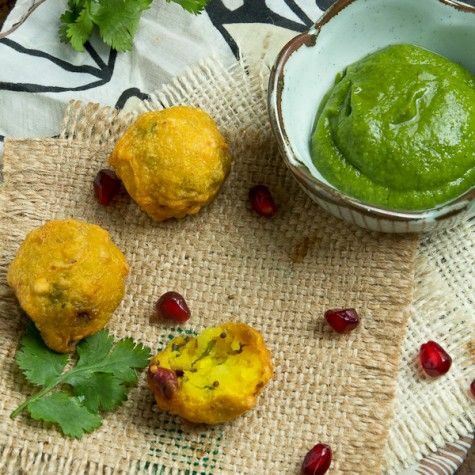 Brilliant:) I had batata vada gujarati way, now I am tempted to make them with garlic. These look so yummy. I love anything with potatoes and adding all those spices sounds heavenly. Thanks Barbara! They really are addictive! My husband and I used to order these all the time at an Indian restaurant we used to live by. Now I can make them at home! YUM! The last time I had battered potatoes was at the Del Mar Fair ;) They were good, but I'm sure these are much tastier. Your delicious recipe has been nominated as one of the "Top 100 Best Potato Fritters Recipes on the Internet". You can view it and vote for it here: http://potato-recipes.org/best-potato-recipes/best-potato-fritters-recipes-internet/ (position #59).